The administration system of Traditional Chinese Medicine Management was changed several times as the government system reformed from the first year of the Republic of China (1911) until now. The TCM committee was set up under the Department of Health within the Ministry of the Interior after the government relocated to Taiwan. The committee provided advice and recommendations regarding the development of TCM to health authorities. The Department of Health was transferred from under the Ministry of Interior to the Executive Yuan in 1971. The TCM Committee has remained since establishment by the Executive Yuan. The TCM management services grew rapidly due to strong worldwide demand for TCM. 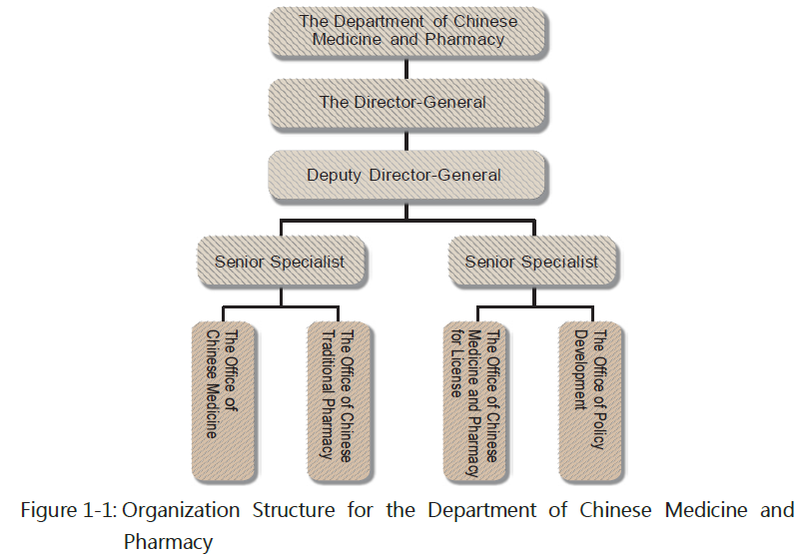 Committee of Chinese and Pharmacy was officially established by the Executive Yuan in November 1, 1995. This institution is not only an administration service, but is also a critical point in the TCM development history. The Committee includes four services teams, Chinese medicine, Chinese pharmacy, research and development, information resources and records. It is also responsible for TCM administration and services promotion. 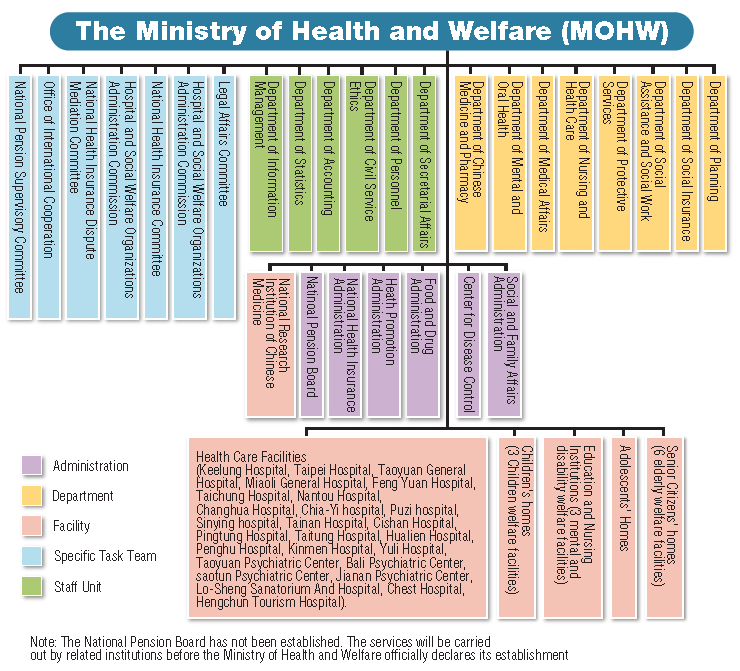 Owing to the reorganization of the Executive Yuan, the Ministry of Health and Welfare (MOHW) was established on July 23, 2013 to combine the former original Department of Health of the Executive Yuan with the social service administration business of the Ministry of the Interior. The TCM Committee of the Health Department in the Executive Yuan was incorporated into the Ministry of Health and Welfare and re-named as the Department of Chinese Medicine and Pharmacy (DCMP). The position was upgraded from a level three to a level two institution. “The National Research Institute of Chinese Medicine”, formerly under the Department of Education originally was renamed “National Research Institute of Chinese Medicine, Ministry of Health and Welfare” as a level three institution. The Research Institution co-operated with the DCMP to promote the development of TCM in Taiwan. The Ministry of Health and Welfare was newly established in 2013. It included the former Executive Yuan's Department of Health and five sub-institutions, the Department of Social Affairs from the Ministry of Interior, Children Bureau, the Committee for Prevention of Domestic Violence and Sexual Assault, the National Pension Supervisory Board, the National Research Institution of TCM in the Department of Education and so on. After reorganizing the MOHW became a Ministry with 8 departments, 6 divisions, 6 level-three agencies (institutions), 26 ministerial hospitals, and 13 social welfare institutions. The Department of Chinese Medicine and Pharmacy, the Department of Medical Affairs which administers Western medicine, and the Department of Mental and Oral Health which administers dentistry are among the 8 MOHW departments. Planning and promoting the administration policies of TCM and related regulations. Planning and promoting the policies of medical human resource growth, the administration of TCM workers and related regulation. Planning and promoting the administration policies of TCM health care facilities and related regulation. Planning and promoting the administration policies of TCM & herbs and quality improvement and related regulation. Other items regarding Traditional Chinese Medicine administration.